I will say despite my infrequent posts my title game has gotten strong. The silky smooth moniker is relevant I promise. Work really gets in the way of my blogging lifestyle. Although if my blogging lifestyle paid me the same as work well then I wouldn't work haha! Season is obviously over. The team with the best record in the regular season won the whole thing. Not overly surprising they were obviously very good. All the talk on the sportstalk radio around here is Harper or Machado. I have a sinking feeling that we aren't getting either. I would love both of course (hey not my money). The Sixers completely whiffed on everything this off season. The Phillies might too. Either way we still have Hoskins who I obviously like. The pitching has to take a step forward this year. Nola was a beast but after that it was just cross your fingers that they don't get blown up. Check out this 'silk' card! 2012 Topps was a good year. Nice design good looking parallels. I have a few of these silk cards now and would not be opposed to adding more! 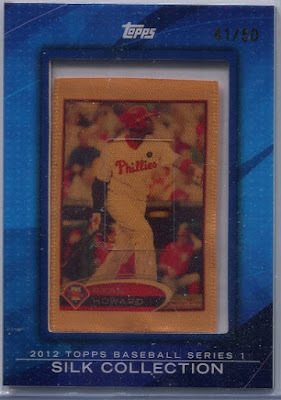 The 2011 John Mayberry silk is the only way (AFAIK) to get a John Mayberry card in the style of 2011 Topps, and the 2010 Roy Halladay is a photo not used elsewhere. Besides those, I think at least the Phillies silks are all just duplicates of their base Topps cards. Have you seen any others that are different? 2018 Topps Chrome Sapphire Phillies!